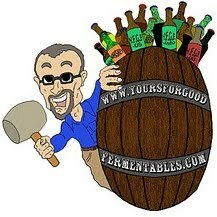 "From Grain to Growler": The state of 'craft' beer in the state of Virginia. 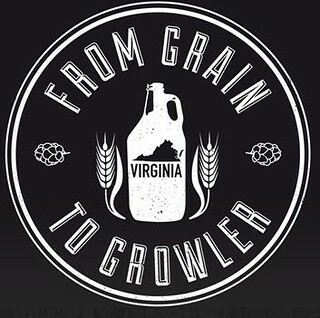 "From Grain to Growler" is a newly produced documentary 1 on the history and recent growth of 'craft' beer and breweries in Virginia. 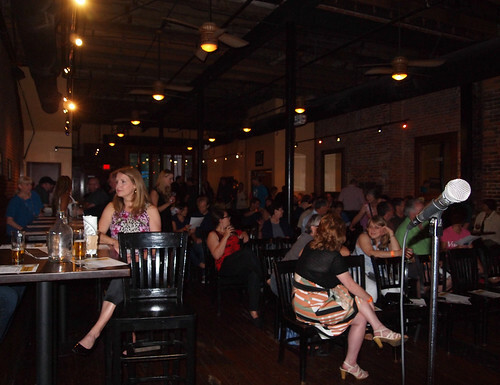 The film was publicly screened for the first time, on 9 August 2014, to a full house, at the Capital Ale House, in downtown Richmond, Virginia. 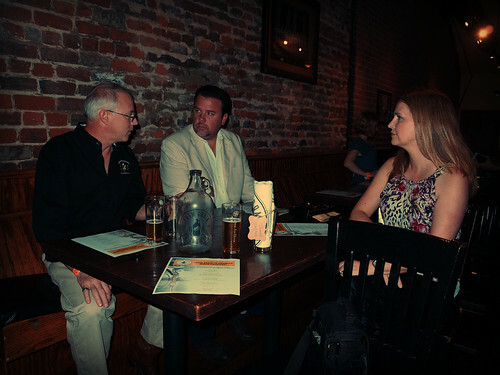 I watched it, sitting at table with Dave Gott (l) —Vice-President of Operations for Legend Brewing Company (of Richmond, Virginia)— and Brett Vassey (c) —President of the Virginia Manufacturers Association, the parent organization of the Virginia Craft Brewers Guild. 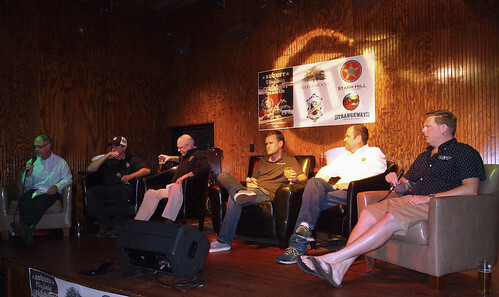 About forty-five minutes later, and after filmmakers Megan Troy and Aaron Stanley took their bows, a panel of five Virginia brewers discussed the film and the state of 'craft' beer in the state. Hunter Smith —owner/brewer, Champion Brewing Company (Charlottesville). "From Grain to Growler" affords Legend Brewing a prominent place in the film, properly, as this Richmond brewery is the oldest extant microbrewery, that is, 'craft' brewery, in Virginia. But the film leaves several other pioneers of Virginia beer —some that preceded and some that followed— unheralded. (I address some specifics: here.) That's a lack of historical context for a "documentary chronicling the rise of Virginia craft beer." Substantial footage wasn't required (or practical), but a simple mention or slide would have sufficed. In addition, brewers needed to be better captioned for identification: not all viewers of the film will be familiar with all Virginia 'craft' beer, and ten or more years from now, some names of brewers and breweries, unfortunately, may be forgotten. 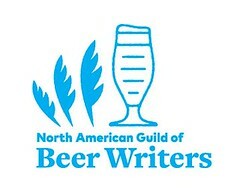 Some brewers were pictured hurriedly, without audio and without ID. But ... all in all, "From Grain to Growler" was well-produced, with good production values, and done so, lovingly. It's a snapshot of 'craft' beer as it is now, in Virginia. The audience received the film enthusiastically, and there was ample beer for all to drink. Virginia 'craft' beer, of course. 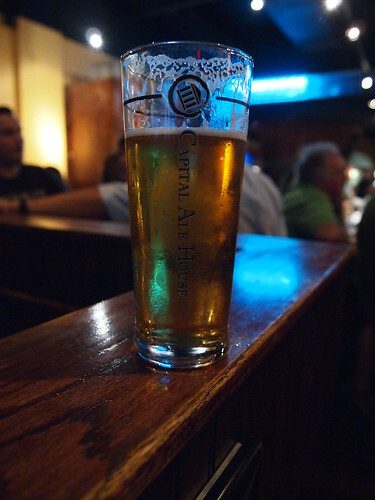 On draft: Killer Kölsch, from Champion Brewing, of Charlottesville, Virginia. 2The Virginia Manufacturers Association provided many of the statistics on the growth of the 'craft' beer business in Virginia —both the rapid increase of the number of breweries and the growing economic impact. Read more, in an article published on 30 July 2014, in Virginia Business, written by Lee Graves, the beer columnist for the Richmond Times-Dispatch. A second screening is scheduled for 20 August 2014, in Harrisonburg, Virginia. The filmmakers have plans to make the film publicly available: details to be announced at a later date. It was appropriate timing for the film's release, as August is Virginia Craft Beer Month. #VeggieDag Thursday: Quick Links for August 2014. Dominion Brewing celebrates its 25th anniversary! Pic(k) of the Week: What's on tap at Jailbreak? #VeggieDag Thursday: Quick Links for July 2014. In Virginia, in August? Drink its beers!